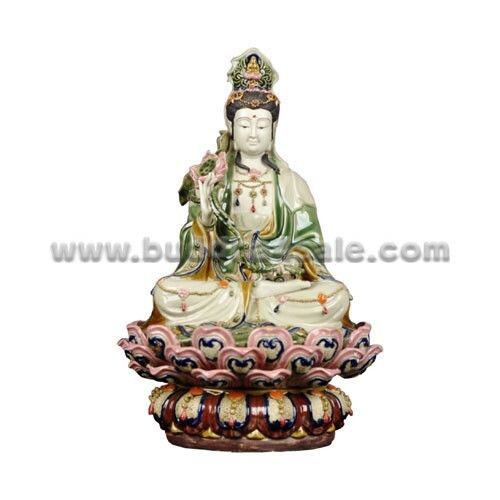 Mahasthamaprapta is a Bodhisattva Mahasattva that represents the power of wisdom, often depicted in a trinity with Amitabha and Avalokitesvara (Guanyin), especially in Pure Land Buddhism. His name literally means “arrival of the great strength”. Mahasthamaprapta is one of the Eight Great Bodhisattvas in Mahayana Buddhism, along with Manjusri, Samantabhadra, Avalokitesvara, Akasagarbha, Ksitigarbha, Maitreya and Sarvanivarana-Vishkambhin. 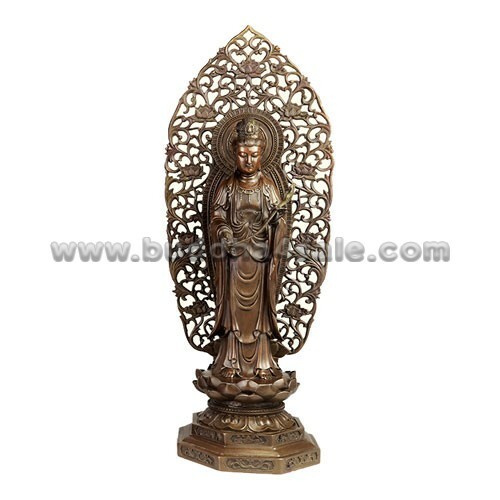 In Chinese Buddhism, he is usually portrayed as a woman, with a likeness similar to Avalokitesvara. He is also one of the Japanese Thirteen Buddhas in Shingon. In Tibetan Buddhism (Tantrism), Mahasthamaprapta is equated with Vajrapani, who is one of his incarnations and was known as the Protector of the Buddha. Mahasthamaprapta is one of the oldest bodhisattvas and is regarded as powerful, especially in the Pure Land school, where he takes an important role in the long Sutra of Infinite Life. He is also associated with the temple guardians Kongo Rikishi across Japan. In the Shurangama Sutra, Mahasthamaprapta tells of how he gained enlightenment through the practice of Buddha recitation, or continuous pure mindfulness of Amitabha, to obtain samadhi. In the Contemplation Sutra, Mahasthamaprapta is symbolised by the moon while Avalokitesvara is represented by the sun.